Becoming a professional angler is all about improving the amount of fish you get in the boat and while you do not want to spend absurd amounts of money to fuel your hobby, there comes a time for every angler to upgrade to something stylish and still effective. The Lowrance Elite-12 is quite an expensive fish finder and while it might not compare with the HDS Gen 3, it is a little more affordable and easier to use. This fish finder is one of the largest displays ever made by the Lowrance Company and it includes all of the top features found in the HOOK series, with the added features found in the heavy hitters of the new Elite series. Fishing Tech happily gives the Lowrance Elite-12 Ti fish finder an overall rating of A. Designed with the same quality CHIRP sonar technology found in many other high-end fish finders, the Lowrance Elite-12 Ti offers multiple different frequencies for fishing. The frequencies found used for the CHIRP technology are 50/83/200 kHz, while the additional StructureScan relies on 455/800. It includes a SideScan feature ranging between 100 and 300 feet. The overall maximum depth of the fish finder is similar to the other devices found in the Elite range and it is 1000-feet for the CHIRP sonar while coming down to 300-feet for the DownScan feature. The TotalScan transducer made specifically for the Elite series is also included in the packaging to access all of the DownScan and SideScan features and it allows the user to use the CHIRP mid-range and high range modes. The Lowrance Elite-12 Ti features a massive 12-inch diagonal display, with a 16:9 aspect ration and a functional backlight that can be toggled for bad weather situations. It features a pixel resolution of 1280H x 800V to bring crispness to the images provided from the sonar. This fish finder also includes the multi-window function that made the HOOK series so popular, allowing users to view multiple different screens simultaneously. Advanced signal processing links to the display and since all of the features can be accessed with one hand, the addition of ASP allows the user to continue fishing or finding the right spot while the fish finder automatically adjusts the settings with the help of the data that has been collected. This helps users avoid potentially harmful objects in the water. The world has been taken over by the internet and every technologically advanced device has some sort of connectivity nowadays. The Elite-12 Ti features a Wi-Fi connectivity that helps users connect to the GoFree app. The app is used to download and upgrade the software as well as saving and sharing your top hotspots and waypoints with other users. The additional Bluetooth feature also enables users to connect the device to their tablets and Smartphones and remotely control the settings if needed. Finally, the MicroSD card slot is included to save all of the downloaded software and maps when expanding your library. The Lowrance Elite-12 Ti comes with Insight Pro cartography by C-MAP. This includes the LakeInsight and maps and more than 3000 different maps of locations in and around the US. The Mapping system also enables users to plot up to 300 different waypoints and save all of their fishing hotspots for later use or to share online via the app. Many more maps and charts are available for purchase via the app and the famous Insight Genesis has also been included. It enables users to build their very own custom maps of locations and save these or also share them with other app users. 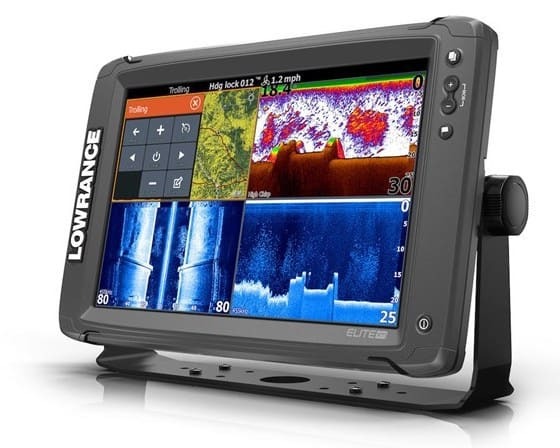 The Lowrance Elite-12 Ti comes as one of the top fish finders from Lowrance. The fish finder might be large to carry around, but the larger display and the addition of alarms for objects and fish, make it virtually impossible to have anything slip by unnoticed. The touchscreen makes it easier to navigate the screen, whilst still keeping your focus on fishing and finding the right location. In terms of durability, the fish finder has a waterproof rating of IPX7. This means that it has the ability to resist 1 meter of water for up to 30 minutes, but unfortunately, it is not shock resistant. The sonar and transducer work extremely effective and it can be used in icy conditions as well if you love the thrill of ice fishing. The ability to connect remotely and use the fish finder on your Smartphone or tablet is certainly a great benefit, but in the water, the fish finder does the real magic. The use of fishing icons instead of arches makes it easier to discern between junk and the additional backlight gives you the versatility to use the fish finder in virtually any weather condition. The display is crisp and the multi-window feature adds to the versatility, enabling users to see multiple different stats whilst still scanning the water for fish. The one thing we would like to see improved is the portability and without a stand, it means the fish finder should always be mounted. Luckily, the addition of a quick release bracket makes this much simpler than it used to be. Lowrance prides itself on the quality of their GPS and mapping technology. The Lowrance Elite-12 Ti enables users to set multiple waypoints and this can be shared with friends. However, the real functionality comes from the Insight Genesis feature that allows you to create your own maps and show off your fishing expertise. We love the GLONASS antenna and it is extremely sensitive to any changes to ensure that you never get lost or steer off of your marked waypoints. The other downside to this feature is that all of the additional maps must be purchased if you plan to expand your map and chart library. This could turn out to be quite expensive when adding up all the costs. While not the number one fish finder on the Lowrance list, it is definitely at the top when looking for value and affordability. The Lowrance Elite-12 has a few more features than the Elite-9 but lacks the crispness of the HDS. It is still quite expensive and should be an ideal fish finder for the avid angler fishing inland. The Lowrance HDS-12 Gen3 features a 12-inch display with crystal clear picture and it comes with a fully functional keypad, but can be used as a touchscreen device as well. It includes a stand, making it portable and this means that you need not put in all the effort of mounting it to one boat if you have different vessels. The Lowrance HDS-12 Gen3 is one of the top fish finders for serious anglers. See our Lowrance HDS-12 Gen3 review. Since the Lowrance Elite-12 Ti is not the cheapest of fish finders on the market, it does have a few noteworthy competitors also offering great value for your money. The Raymarine a97 Fish Finder is one of the more affordable fish finders in the high-end range. It also features a 9-inch display system, but only has a maximum depth range of 600 feet. It comes with a stylish design and a touchscreen interface. The Raymarine a97 Fish Finder should be the perfect affordable alternative. Finding a good balance between quality and value for your money seems to get harder by the day. But finding a fish finder that caters to all the needs of most angler can be even harder. The Lowrance Elite-12 Ti seems to change this and while it is still quite expensive and there is room for improvement, it is still one of the top fish finders on the market today. The fish finder combines all the essential features of the previous models while adding its very own twist. Fishing Tech happily gives the Lowrance Elite-12 Ti an overall rating of A and we would highly recommend it for the avid inland anglers looking for all the features in one large device.